All large successful companies have "growth models--that is to say, key feedback loops that drive sustained customers, acquisition, and business growth. The concept of a growth model, or growth loop as it's often called, is relatively new, and has been popularized by leaders in the growth community, like Andrew Chen, and programs like Reforge. At its core, the idea is very simple. What are the ways that your business acquires customers? They're called loops because they should be circular and compounding. 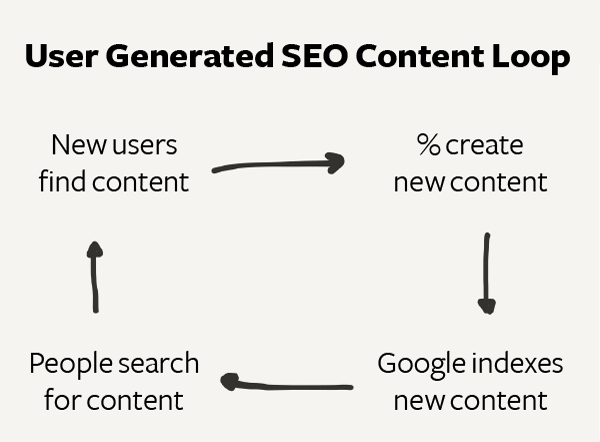 Some common examples of growth models include paid acquisition, viral invite, two-sided marketplaces, and user-generated SEO content (see image below). Defining your company's growth using a model helps identify high leverage "inputs" (areas of your business that you have control over) that can amplify compounding growth over time. Additionally, these high impact growth models help you choose which metrics to measure—and set goals against—to get a clear understanding of your growth progress. Identifying your growth model requires thinking holistically about each cohort of your users and how they can acquire the next cohort of users. This means looking step-by-step at your user journey and mapping them to discrete actions. The final cohort then "becomes" the next base cohort from which the actions in the loop start again. After identifying the feedback loop, then it's time to mathematically define each step. Note that the final total number of users in the first time period will become the starting number of users in the next time period. We start by keeping things as simple as possible and using percentages in the spreadsheets below. Lastly, you can deduce key metrics with sensitivity analysis on the mathematical model. Due to the compounding nature of the growth feedback loop, some assumptions have a greater amplifying force on growth over time (e.g., conversion to sign ups vs conversion to paid). We'll illustrate this in our examples below. Here is a mathematical model in Google sheets to represent the user generated content functions. With this model, we can identify areas of high leverage by adjusting assumptions and seeing their impact on the growth trajectory of the company. For example, we can see if improving the conversion rate of users who generate content or focusing on acquiring new users would generate more money. The graph above is taken from the aforementioned Google spreadsheet. The "2x generate content" case assumes the % of users who generate content is twice as much as the base case, whereas the 2x signup case assumes the conversion to sign up is doubled. This model suggests improving the signup conversion has more compounding effects than content generation conversion. When we remove ourselves from the mathematical model to do a quick gut check, we can see that these are the key metrics that'll move the needle the most. If we can incentivize users to generate more content or optimize the conversion from visitors to signups, we can see compounded growth over time. This is a popular model for many social games or apps (e.g., Snapchat, Venmo) that asks users to invite friends via importing their address books. 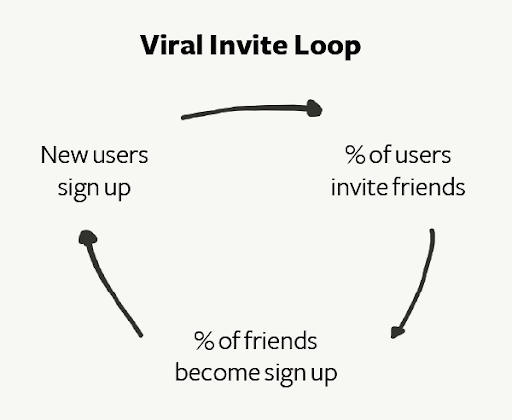 Many companies experienced massive growth leveraging this viral loop. When Facebook launched their graph API, users could suddenly ask all their friends to help harvest their Green Wheat in Farmville, and the game took off over night. It's worth noting that the best viral loop examples are almost always found with consumer companies. Here's a mathematical model in Google sheets to represent this growth model. Again, we use this model to see which assumptions move the needle the most. For example, we can see the impact on growth if we improve each percentage point of number of users who invite their friends. The second "Double any key assumption" is the case where either the % of users invited or the % of invited users sign up are doubled. The math happens to work out that way. It makes sense that these are the metrics that can significantly add growth over time. If users were more incentivized to invite their friends, then that leads to a greater pool of users who can convert to registration. Seeing that these areas are higher leverage, it makes sense to optimize for those metrics so you can reap the growth benefits later. 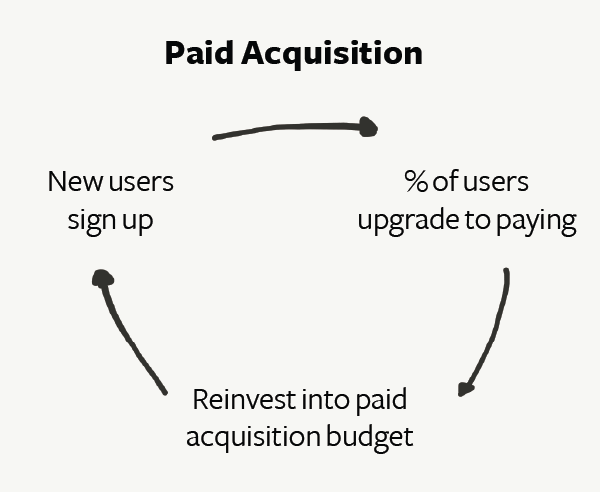 The paid acquisition growth model is slightly less exciting, but it's how many companies scale efficiently. Existing users don't directly help you acquire new users, but they generate revenue that you can to reinvest in paid marketing. For example, for a company that earns $100 reinvests that money into new acquiring new users. From that cohort, the company makes $80 to reinvest again. This model assumes that the cost of acquiring the user is less than the lifetime value of each user (most VC's and founders say that the acquisition cost should be ⅓ of the lifetime value). Here is a template mathematical model for the paid acquisition growth model. Graph above is taken from the aforementioned Google spreadsheet. We see that doubling the conversion rate to paid has a higher impact than doubling "margin" (calculated as LTV - CAC). It's not trivial to optimize any of these three metrics (it probably will take resources across several teams within a company). However, each KPI can significantly improve the effectiveness of a single marketing dollar spent. Higher LTVs and lower CACs can make the dollar work for acquiring more users, and a higher percent of paying customers leads to a larger marketing budget. The two-sided marketplace model has become more and more popular, as technology helps buyers and sellers transact more easily with one another. For example, Uber, Etsy, Segment, and Grubhub all represent marketplaces. Growth in a two-sided marketplace relies heavily on the increasing value one side gets from the other. What value do drivers get from more riders and riders from more drivers? Each network effect can be modeled out. If you want to dive deeper in how we do marketplace growth analysis at Segment, check out our post on modeling two-sided marketplaces. Buyer-to-seller cross-side: Prospective buyers tell prospective sellers that they prefer to do business on the platform. "It was hard to find your place. How come you don't list on Airbnb?" Seller-to-buyer cross-side: Prospective sellers expose prospective buyers to the platform. "Buy my adorable elephant mittens on Etsy." Buyer same-side: Buyers love the new transaction experience, and tell other prospective buyers to use the platform. "Why would you use a taxi? You should check out Lyft." Seller same-side: Sellers love the new transaction experience, and tell other prospective sellers to use the platform. "I made a good chunk of change while I was on vacation, renting my place on Airbnb. You should try it out!" Direct to buyers: The marketplace tells buyers about itself directly. "Wow, Uber has a lot of billboards here." Direct to sellers: The marketplace tells sellers about itself directly. "I searched for jobs in Cincinnati and found Lyft." Here's a sample mathematical model that we used for two-sided marketplaces. Note that this example is a little more involved than the previous ones—the template is a fictitious Segment, with one side being "customers" and the other being integration "partners." For more information, we kindly direct you to this section of "How we model growth for two-sided marketplaces," where we look at tinkering with a single assumption to project growth. Often the highest contributors to growth depend on your company's stage. For example, if it's too early for any of the cross-side or same-side marketplace growth dynamics to be a major contributor to growth, then you should focus on growing one side of the marketplace. For example, at Segment, we started by building up our catalog of integrations partners ourselves to attract customers. Then, as we gained more traction and had a critical mass of integrations, we started to think about how we could better work with our partners to drive more customers to Segment. Using a growth model makes it easier to derive a set of metrics to track and set goals against. The model, when represented mathematically in a spreadsheet, enables you to easily adjust the assumptions to determine which focus area can lead to the most compounded growth. And remember, this model is not for financial planning and projections about what will happen. They're to be used as strategic tools to understand what the business could do so you can see the bounds of what strategy you can invest in. That being said, once you identify the set of metrics that are most impactful, it's a matter of holding teams accountable to one or two metrics and really focusing on tasks and experiments that can move these numbers. What we've found to be most effective is to hold each team accountable to one (or two, max) of these metrics, then prioritize experiments that can improve those metrics. While we covered four common growth models in this lesson, there are many others! If you have any ideas, please share them by tweeting at us!